Beginning with horse-drawn coaches and progressing through today’s modern buses, there is a long tradition of public transportation in Bloomington-Normal dating back to the 1800s. However, it was not until the private National City Lines bus company left the Bloomington-Normal market in 1972 that the current Bloomington-Normal Public Transit System was formed. A joint effort of the City of Bloomington and the Town of Normal, the transit system operates as an independent agency governed by a board appointed by both the City and Town. 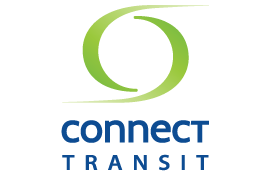 In 2012, the transit system rebranded as Connect Transit and now the Bloomington-Normal community is served by a fleet of 56 transit vehicles and over 115 employees.